The éclair takes its name from the French for 'lightening', supposedly a comment on the speed with which they were traditionally eaten. Whether or not this etymology is correct, a plump, fresh éclair is irresistible and if you whip up a batch yourself they're likely to be gone in a flash once your guests get wind of it! Finger shaped choux pastry filled with cream, an éclair makes a fantastic blank canvas for experimentation with colours and flavours. 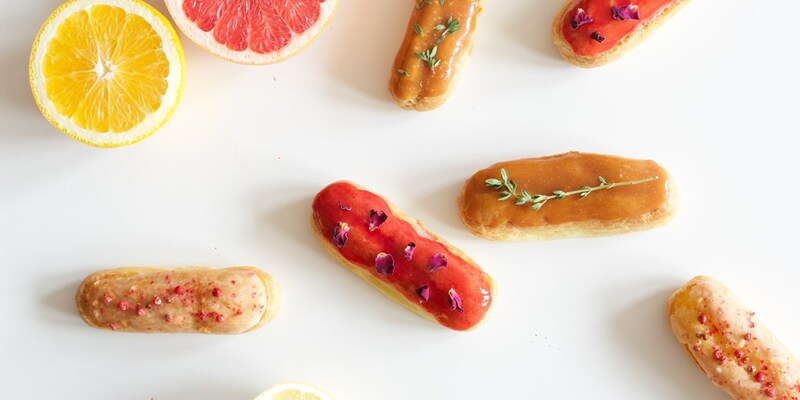 For a pretty pink option give Nancy Harbord's Raspberry and rose éclair recipe a go, or try her Gin, citrus and pink peppercorn éclairs for sweets with a kick. Her sophisticated Salted caramel éclair recipe is given a twist with the addition of lemon thyme, while Lisa Allen makes a fun festive dessert with her Christmas éclair tree - perfect for baking with children. If you've never made éclairs take a look at our guide on how to make choux pastry before you begin.